Game On Expo is this week! If you’ll be at the Mesa Convention Center this weekend, let me know so I can say hi. This is the third retro video game article leading up to Game On Expo and I’m going to *attempt* to publish one more before Friday. Without going into the history of game developer and console maker Sega, let’s just say they had already experienced a few hiccups with the Sega Cd and the 32X. Along came the Sega Saturn in which the launch in the U.S was badly mishandled and over price. Fast forward to 1998 and I talked my parents into getting a Saturn which is was $99 at Walmart. Fast forward a few more years and it’s 2002, I just finished high school and I was working with no bills to worry about. I took the opportunity to buy video games I had always wanted (it was extreme, my collection ballooned to over 400 at that point). One of those games I purchased was a Japanese copy of Christmas Nights for the Saturn. 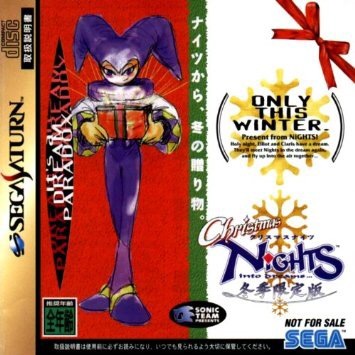 It was a two level sampler of the normal release of Nights: Into Dreams but with a Christmas theme and story. Again, it was much more than a glorified demo but it became one of my favorite tradition. When I purchased the game, I popped it in and to make sure it worked and then stored it away only to be played a week later on Christmas Eve. The game would be dusted off every Christmas Eve to be enjoyed. I’m really into Christmas and Christmas Nights was a great addition to things I enjoyed during the holidays. As the character Nights, you fly through the snowy level that is made up of Christmas decorations and lighted up trees awhile enjoy a hybrid of the original score and Christmas tunes. An interesting note that I just recently discovered is that the Christmas aspect of the game is only playable during the winter season thanks to the internal clock of the Saturn. If played in May for instance, you play a demo of the original Nights: Into Dreams with no alterations to the visuals and music. Do you have a favorite game to play every year? Let me know in the comment section below.